5625 Police 4x4 is a City set released in 2008. 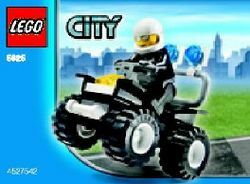 It contains 33 pieces to construct one police Minifigure and a 4x4 quad bike. Facts about "5625 Police 4x4"
This page was last edited on 9 February 2019, at 19:43.